Includes annual resident and non-resident tuition, general fees and other fixed costs associated with instruments, textbooks and health services. 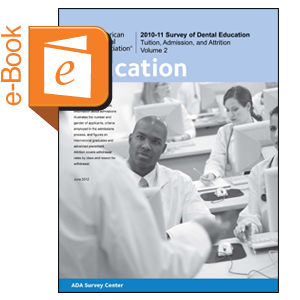 Also provides information on current first-year class; admissions policies of dental schools in U.S. and Canada; the number of applicants; academic qualification of first-year students; criteria employed in the admissions process; advanced placement and number of foreign dental school graduates; distribution of first-year students according to citizenship; first-year tuition and annual educational expenses; and, detailed information on students withdrawing from dental school, transferring to another institution, repeating of academic years, or suspending studies. This is a downloadable report, which is also available free of charge at www.ada.org/edreports.